4 shows in Tôkyô (Kabukiza, National Theatre, Akasaka Act Theater), 2 in Ôsaka (Shôchikuza), and 2 tours (Eastern Provinces, Central Provinces)! Onoe Kikunosuke, Kataoka Ainosuke, Ichikawa Somegorô, Onoe Shôroku and Ichikawa Danzô perform at the Kabukiza! Kataoka Nizaemon, Nakamura Hashinosuke, Nakamura Kanjaku, Kataoka Gatô, Nakamura Senjaku, Nakamura Fukusuke, Kataoka Takatarô and Kataoka Hidetarô perform at the Shôchikuza! Nakamura Tokizô performs at the National Theatre! Nakamura Kichiemon, Nakamura Shibajaku, Nakamura Matagorô, Nakamura Kashô, Nakamura Kinnosuke and Nakamura Karoku are on tour in the Central Provinces! The new Ichikawa Ennosuke, the Omodakaya guild and Nakamura Baigyoku are on tour in the Eastern Provinces! Living National Treasure Bandô Tamasaburô performs at the Akasaka Act Theater! 4th month celebrating the opening of the new Kabukiza within a 1-year long cycle of kokera otoshi programs. Two spectacular dramas full of keren with young stars! This play is a sequel to an earlier classic in which the evil lady-in-waiting Iwafuji caused the death of her rival Onoe by excessively persecuting her, including beating Onoe with a saddle. One ear later, Onoe's servant Onoe II (Onoe Kikunosuke), who avenged her death by killing Iwafuji, has come to pray for the comfort of Iwafuji's spirit (Onoe Shôroku). Iwafuji's bones come together magically and her spirit floats among the cherry blossoms. Later the spirit appears at the mansion to beat Onoe II with a saddle. Evil forces are plotting to take over the Taga household where Onoe works. The servant Torii Matasuke (Onoe Shôroku) is harboring the faithful retainer Motome (Onoe Matsuya). He decides to kill his lord's consort, an evil woman who is one of the main forces in the plot, but through the scheming of another, he ends up killing his lord's wife instead. The death is blamed on Motome, and Matasuke must take his own life to clear Motome's name. In the end, the lord defeats all the evil forces threatening his realm and the ghost of Iwafuji returns to the afterworld. This play features spectacular special effects and large-scale fight scenes. Featuring also Ichikawa Somegorô and Kataoka Ainosuke. Yotsuya Kaidan: Iemon, a villainous masterless samurai (Ichikawa Somegorô) is in love with Oiwa (Onoe Kikunosuke) and even kills her father to be united with her, cynically promising to help her to avenge her father's death. But at the same time, the granddaughter of a wealthy doctor falls in love with him and her grandfather tries to ensure the match by sending a horrible disfiguring poison to Oiwa. In the most famous scene of the play, face destroyed, hair falling out, Oiwa carefully dresses and puts on make-up to pay a proper visit to those who have wronged her. Iemon kills Oiwa and his servant Kohei (Onoe Kikunosuke), has their bodies nailed to a door and thrown into the river. Iemon is happily married into the wealthy family, but no sooner does the beautiful young bride arrive than Oiwa's ghost causes Iemon to kill her. The vengeful ghosts do not rest until all of their enemies are dead and, in another famous scene, Oiwa and Kohei appear floating on the river, calling out to Iemon. The concluding scene shows the ghost of Oiwa appearing mysteriously from inside a paper lantern and pulling her enemies into the wall and disappearing magically. Featuring Onoe Kikunosuke and Onoe Shôroku in the roles Satô Yomoshichi and Naosuke Gonbê. 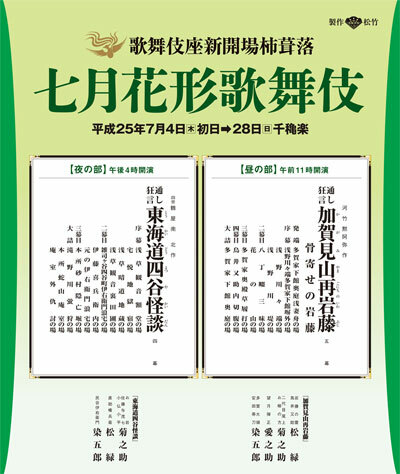 22nd edition of the Kansai Kabuki Lovers Society July Grand Kabuki in Ôsaka. A modern play by a 20th-century playwright Uno Nobuo. Yanagisawa Yoshiyasu (Nakamura Hashinosuke) hopes nothing more than rising in the world as his mother hoped. Osame (Nakamura Fukusuke) wants on the contrary nothing but love with him, but he recommends her as a concubine to Tokugawa Tsunayoshi (Nakamura Kanjaku), the 5th shogun of the Tokugawa shogunate. Thus he gets ahead in the world by making up to Tsunayoshi and his mother Keishoin. He has no hesitation in killing anybody who stands in his way, but what he ultimately obtained is only love of his lover Osame. Featuring also Nakamura Senjaku, Kataoka Takatarô and Kataoka Hidetarô. Yasuna: after the death of his lover, the handsome young Yasuna wanders through the open fields madly searching for his love. The tragedy is a contrast to the beautiful setting, a field of brilliant yellow flowers and the lush, sensuous Kiyomoto narrative music that accompanies it. Starring the young onnagata star Kataoka Nizaemon in the role of Yasuna. A modern play by Okamoto Kidô. Soga brothers Jûrô (Nakamura Kanjaku) and Gorô (Kataoka Shinnosuke) have waited for 18 years to avenge their father's death. Their elder brother Kyô no Kojirô (Kataoka Gatô) will neither prevent them from taking their father's revenge nor participate in it, because he feels stronger longing for his real father than for his second father, the real father of Jûrô, Gorô and Zenjibô (Bandô Shinsha). Their youngest brother Zenjibô comes long way from Echigo province to visit their father's grave. As he hears his brothers taking their father's revenge, he would like to take part in it. But they object to it; as a monk he is not skilled in handling swords and they hope he will pray to the Buddha for the repose of their soul after they have succeeded in avenging their father's death that will result in a death penalty. Ichijô Ôkura Monogatari: the world is ruled by Taira no Kiyomori, the leader of the Heike clan. Tokiwa Gozen, the widow of the head of the defeated Genji clan and mother of Yoritomo and Yoshitsune, the future leaders of the clan, has become the mistress of the dictator Kiyomori, then the wife of Lord Ôkura, a seemingly simple-minded fool who spends all his time watching pretty women dance. Outraged members of the Genji clan sneak into Lord Ôkura's mansion only to discover that Tokiwa Gozen's immorality and Lord Ôkura's idiocy are a guise, the only way to survive in a world ruled by the enemy. This performance stars Kataoka Nizaemon as Lord Ôkura, Kataoka Hidetarô as Tokiwa Gozen, Nakamura Hashinosuke as Yoshioka Kijirô and Kataoka Takatarô as Yoshioka's wife Okyô. A drama by Tsuruya Nanboku IV about fascinating characters against the background of a bygone, decadent age. A samurai Sano Jirozaemon (Nakamura Kanjaku) loses a precious sword which is the heirloom of his lord and becomes masterless. He searches it to return to his lord's service. He kills the courtesan Yatsuhashi (Nakamura Senjaku) whom he believes has betrayed him; a female snake-charmer Oroku (Nakamura Fukusuke) commits blackmail in league with the evil priest Gantetsu (Nakamura Hashinosuke). The word Kakitsubata in the title is associated with Yatsuhashi, a place name in Mikawa Province famous for iris and also a name of a character in this drama. Another possible reading for Kakitsubata is Tojaku, the haimyô of the Edo star Iwai Hanshirô V, who played the role of Oroku in 1815. Educational program at the National Theatre called Kabuki Kanshô Kyôshitu ("Kabuki Appreciation Class"). 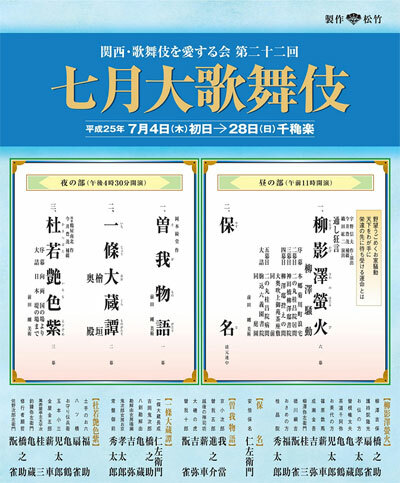 This is a very interesting formula for the beginners because there is lively presentation of Kabuki (or some aspects of the art like music, stage tricks or fighting scenes) on stage, followed by the drama "Kuzu-no-Ha". Kuzu-no-Ha: Abe no Yasuna, a court astrologer in disgrace, has married a beautiful woman named Kuzu-no-Ha, not knowing that she is actually a fox that has taken human form to repay his kindness in saving his life. The couple has a child and lives happily together until the real woman whose form the fox borrowed appears. Knowing that she can no longer stay, Kuzu-no-Ha writes a tearful farewell poem on the paper screen and returns to the wilderness. Starring Nakamura Tokizô as Kuzu-no-Ha and Bandô Shûchô as Yasuna. Nakamura Matagorô III and his son Nakamura Kashô IV celebrate their shûmei touring in the central provinces! Banchô Sarayashiki: the story of Okiku, who became a ghost after breaking one of a precious set of plates and being killed in punishment by a quick-tempered lord, is one of the most famous in Japanese tradition. But this is a modern play, which transforms the ghost story into a portrait of the interaction of contrasting and incompatable personalities. The samurai lord Aoyama Harima (Nakamura Kichiemon) is passionate and quick to fight and is in the middle of a fight when he is stopped by his aunt. She has arranged a marriage for him and Harima is unable to admit that the reason he will not marry is because he is deeply in love with Okiku (Nakamura Shibajaku), a lady-in-waiting in his household. As strong as Harima is, his aunt's will is much stronger. But this makes Okiku wonder about the strength of Harima's love for her and she tests him by breaking one of a set of heirloom plates. When she tests Harima's feelings, this seals her fate and sets the tragedy of the play in motion. Kôjô: the close relationship between the actors and the audience is shown by these stage announcements, lavish ceremonies to commemorate various important events. In this case, all the stars of the cast assemble to celebrate the shûmei of Nakamura Matagorô III and his son Nakamura Kashô IV. Renjishi: 2 entertainers dance a tale of the legendary shishi or lion-like spirits that live at the foot of a holy Buddhist mountain. There is a comic interlude with 2 Buddhist pilgrims. Then, the shishi themselves appear and perform their dance with wild shaking of their long manes. The dance shows a parent shishi forcing his cub to undergo harsh training in order to grow up strong. This theme is often associated with the training a parent actor gives his son. This performance features Nakamura Matagorô in the role of the parent shishi and his son Nakamura Kashô in the role of the cub. Ichikawa Ennosuke IV celebrates his shûmei touring in the eastern provinces! Kenuki: in this play, which retains the light, festive atmosphere of early-period Kabuki, a princess has a mysterious ailment that makes her hair stand on end, an ailment that prevents her from carrying out her long-awaited marriage. Kumedera Danjô comes from the groom's household to investigate and finds a plot to take over the household when his tweezers float in mid-air. Ichikawa Ukon stars in a play that features the bombastic aragoto style of acting that is a specialty of the Ichikawa clan. Kôjô: the close relationship between the actors and the audience is shown by these stage announcements, lavish ceremonies to commemorate various important events. In this case, all the stars of the cast assemble to celebrate the shûmei of Ichikawa Ennosuke IV. Kawatsura Hôgen Yakata: the epic "Yoshitsune and the Thousand Cherry Trees" ("Yoshitsune Senbon Zakura") features many characters around the famous general Yoshitsune, but none more memorable than a magic fox that takes the guise of Tadanobu, one of Yoshitsune's most trusted retainers. The fox wants to get close to a precious drum that Yoshitsune has made from the skins of his fox parents. In this excerpt from the longer play, the fox reveals his true identity with a series of spectacular stage tricks and Yoshitsune is moved to grant him the drum. Starring Ichikawa Ennosuke as the fox Tadanobu. Featuring also Ichikawa Monnosuke (Shizuka Gozen) and Nakamura Baigyoku (Yoshitsune). Living National Treasure Bandô Tamasaburô and the Kodô taiko drummers revive "Amaterasu", which was staged for the first time in May 2006 at the Minamiza [more details].